October 2, 2006, just after 9:30PM EST, on a small peninsula on the Maine coast, a Collins 30K-1 amateur transmitter, serial number 32, returned to life after a 48-year hiatus. This was no simple resurrection, but the culmination of a long journey that started over half a century ago. The journey began in 1947 when serial number 32 left the Collins factory at Cedar Rapids, Iowa, and traveled to the station of Walter Jahries, W7MGA, in Salt Lake City, Utah. 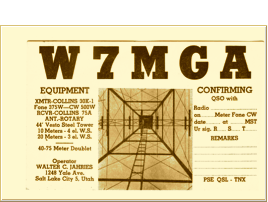 It saw service at W7MGA until sometime in the late 1950s. After the passing of W7MGA the unit was put into storage. In 1991 it traveled westward to Los Gatos, California and the home of Peter K6DGH. Peter, busy with other projects and his Hallicraters HT-4 station, never got around to unpacking the transmitter and getting it on the air. So there it sat, in heated storage, for 15 years, until September 2006, when it headed for the east coast and to my home at Woolwich, Maine, some 59 years after it first rolled off the factory floor. But it was not just the transmitter that survived the half-century of storage and travel, amazingly the complete station, sans antenna, survived intact! For included in the package was the matching Collins 75A-1 receiver, Collins 270G-1 speaker, Collins 310A exciter to the drive the big 30K-1, W7MGA’s manuals, extensive spare parts, a homebrew coil holder and Shure microphone. In other words, the complete 1940’s era station of W7MGA had been transported through time and space to arrive here, the coastal station of W1UJR. A few words about the 30K series. I have been a Collins fan since I was first licensed in the 1990s, but really fell in love with the 30K when I visited the home, perhaps more appropriately, the radio museum, of Todd KA1KAQ. Todd had the commercial version of the 30K-1, known as a 30K-5, and I was privileged to work on it for him last December. Very similar in design, the 30K-4 and 5 are commercial models offering two discreet tank circuits for rapid frequency changes but lack the bandswitching arrangement of the 30K-1. The 30K series was designed by Collins engineer Warren Bruene in 1945 and was first offered for sale the following year. It was, in some way, a “Hail Mary Pass” for Collins as the war contacts were drying up, and yet amateur radio operation was still banned during wartime. Collins forecast a pent up demand from the return of GIs from the war, and with the elimination of the wartime ban on amateur operation, hoped the 30K would fill the gap. 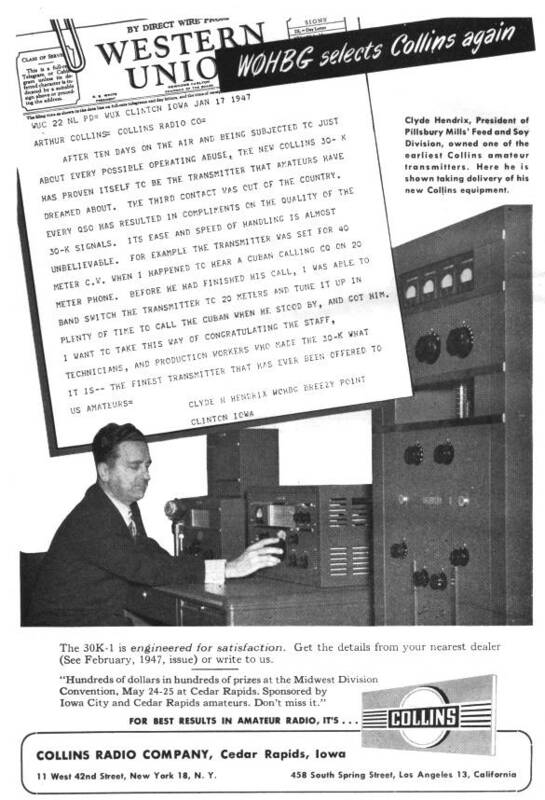 Sales were somewhat limited as the 1946 cost of the 30K-1 transmitter and 310A exciter was $1450, the equivalent to approximately $15,000 in today’s dollars. According to Jay Miller’s, KK5IM, excellent publication, “The Pocket Guide to Collins Amateur Radio Equipment 1946-1980”, less than 100 of the 30K-1 are known to have been built, and few survive today, making serial number 32 a rare bird indeed. Visually, the 30K transmitter series are most impressive to behold, housed in a cabinet 5 ½ feet tall, finished in black wrinkle paint, and weighing over 350lbs, this is a big transmitter! The design of the unit is pure art deco; vertical and horizontal chrome accent strips, a large window for viewing the 4-125 final tube, and a most impressive meter panel at the top of the cabinet, also housed behind glass. Looking every inch a serious transmitter, the 30K-1 is of robust construction along the lines of commercial broadcast gear. Emission modes are CW and Fone (AM), with the plate input power given as 500 watts on CW, and 375 watts on AM. The 30K-1 offered coverage from 80 to 10 meters using two plug-in output coils. With a tube compliment of 11 tubes in the transmitter, and 10 tubes in the 310A exciter, the 30K station as much a delight to operate, as it is to look at. As safe movement of even a small receiver coast to coast is often a daunting task, I wanted to take extra care to make certain that this station, entrusted to me, made the trip intact. I won’t enter the debate of who is better/worse, UPS or FedEx; suffice to say that I have developed two simple rules for safe shipping. First, pack the unit as a box within a box; peanuts are near useless, use bubble wrap and foam. Second rule, the less time in transit, the less change for damage, Overnight or at the very least, 2nd Day Air Ship everything fragile. Fortunately Peter had considerable experience packing and shipping vintage electronic gear, so the process was quite straightforward. Careful packing, with a minimum time in transit, it’s the key to the shipping of fragile electronics. Brian, at JDM Packing in Sunnyvale, CA, did an outstanding job of packing up the 75A-1 receiver and the 310A exciter. The method was surprisingly simple, a large box, then a layer of dense foam, then another box, and again dense foam, followed by the object to be shipped, which was bubble wrapped. I utilized my commercial UPS account to have all the critical items sent overnight to minimize exposure time. All items thankfully arrived without damage, and I saved the packing for future use. With the easy items out of the way, now came the real challenge, how to ship the 5 ½ foot tall transmitter across the country without any damage. Wisely, Peter had already removed the heavy plate transformer and shipped that separately. So with the nearly 75 lbs transformer out of the way, Peter once again called on Brian for assistance. Brian built a large enclosure, again with the dense foam packing, placed the transmitter on its side and then banded the entire unit, all 5 feet of it, to a wooden pallet. Cost estimates were obtained for surface (truck) transport and 2nd day airfreight. Surprisingly the cost differential was minimal, and BAX handled the airfreight duties, delivering the package safely to the door of my office just two days after it left California. My employees, used to seeing various small radio items trickle in, were astonished at the size of this large coffin sized package. I informed them that it contained the remains of a deceased family member, and required special handling! Once it was safely unloaded at my workshop, I let fly that it was in fact “yet another radio”, which brought forth a profound sigh of relief. Whenever I purchase vintage amateur gear, I like to know whom the identity of the previous owner, or builder, and document the construction, use and ownership of the item. The museum people call this “provenance” and use it to establish the authenticity of an item. For my purposes I find this information gives me a greater appreciation of, and respect for, the handiwork of the previous owner. It can also be helpful for restoration purposes, knowing what period of components to use in a rebuild, or even in designing the station configuration. Fortunately Peter remembered the name and callsign of the previous owner, so with the Internet close at hand, it was a simple matter to quickly track down his next of kin. I sent a tentative email off to W7MGA’s son, Conrad, who was most helpful in filling in the details and history of the station. Conrad, shares the history of the station. “That is interesting about your having the old 30K station. Yes, it belonged to my Father, W7MGA (born in Chicago in 1895). I think he probably bought it from Henry Radio in Kansas City, probably in 1947 as he returned from Hawaii in 1946. He was the district manager for S.H. Kress Company in Hawaii and the store manager for the Honolulu store. He retired over there I think in 1946 and moved back to Salt Lake, where he lived before being transferred to Honolulu in 1936. The way he got into ham radio is when we lived in Honolulu, my brother was going to university here in Salt Lake, and he ran into a fellow by the name of Malc Majors. Malc was a ham there (W0OJI) and set up schedules between Hawaii and Salt Lake to talk with my brother. When we returned to Salt Lake he got his ticket probably about 1947, and purchased the Collins equipment. I was in school then and remember his having people up to the house all times of the day and night to have schedules with servicemen in the South Pacific. He was using 4-element beam for 10 meters and 3-element beam for 20 meters. It was home made and sat on top of a 44 ft. Vesto tower. The skip was open then and I think he made most of his contacts on 10 meters. I think 10 meters was open then and the skip was good in the early evenings and people were over to the house almost every day. He did a lot of hamming on 10 and 20, spending most of his time in the shack He sort of lost interest in hamming in the late ‘50s and the Collins sat in his shack for quite a while. When he passed away, I got it and it sat in my basement for several years not being used. I was interested in RTTY when I had Collins here, and used Kenwood Twins when I was on the air, so I never used the Collins or Henry at all. As noted, this time capsule has been unused since the late 1950s, so the task of careful removal of half a century’s worth of accumulated dust and dirt is no simple matter. It calls for both a through and methodical approach, while preserving the integrity of the unit to be restored. This 1940s vintage Collins 30K-1 has not traveled through time and space only to be damaged at my hands. So I proceeded with the utmost care. Each part, nut, bolt, screw that I removed was placed in labeled sandwich bags for later cleaning and evaluation. I carefully photographed and noted the location of each wire disconnected so it could be put back into its proper place (digital cameras are excellent for this purpose). There are two basic schools of thought on restorations. The first school takes the approach to make every nut and bolt shine, to polish IF cans and other sheet metal to a mirror finish. To in short, make the unit more of a piece of art, eye candy if you will, than the purpose it was designed for. An apt analogy for this school of thought might be a heavily chromed and tricked out 1957 Chevy at an auto-show vs. the daily driver. Over the years my approach to restoration has moderated, as you will note below. My current theory behind most of my restorations, and this unit is no exception, is to return the item to be restored to the condition in which it left the factory. This means the use of the same style hardware, like kind and type of wiring, and same finish, if refinishing is needed. I’ve moderated on the depth of restoration efforts over the years, accepting the “in-service” look as opposed to the overly done, polished chassis approach. This is no way means that I compromise on my efforts, it simply means that I restore the transmitter to the level which a ham of that era would see the unit. It should look, for all intents and purposes, like it was NOT restored but is simply an in-service unit. In most cases this means keeping intact the original finish, labels, sheet metal finish, etc. Dependent upon the restoration, I do endeavor to remove modifications added over the years, the goal being to return the unit to the standard operating condition. Nor do I ever really “finish” a restoration. Often I will pull a unit out of service after perhaps six months or years worth of use, and go through it yet again. With older gear, parts will invariably be damaged or missing and often not readily available during the first restoration. So I will employ “field expedient measures”, temporary fixes if you will, to allow the unit to operate, while scouring hamfests and the Internet for the needed part. It is during this second trip to the bench, I find myself carrying out additional cleaning, realignments, and checking component values again. Despite a through “burn-in” effort during its initial visit to my test bench, oftentimes certain components don’t fail until they have some additional time and use. So, in general, my time is spent correcting any overlooked, unsatisfactory items from the first work. I find it often takes 2-3 trips to the bench before I m satisfied that I have the unit ready for another 50 years of service. So, let’s start with the first part of any amateur radio station, the receiver. The receiver, exciter and plate transformer had arrived first while Peter made preparations to ship the large and more cumbersome transmitter. Restoration work on the W7MGA’s 75A-1 receiver began on Sunday, September 10, 2006. For a receiver which appears to been unused for nearly half a century, this A-1 was in surprisingly good condition. Before I even attempted to fire it up, I did the standard W1UJR clean and restoration. When cleaning an old radio, the first order is to remove the dust, then concentrate on cleaning the chassis and other components. I’ve found it far easier to vacuum or blow said dust off than it is to get it wet and try to wipe it down. So out came the trusty Shop-Vac with the small brush attachment. Always use a brush if possible, it really helps to loosen up the caked dust, much more efficient than using just a nozzle itself. Before cleaning 49 years of dust! When restoring gear that has been out of service for some time, one must be very careful of the presence of rodent droppings. It’s not much the droppings that are the problem as it is the potential for transmission of the Hantavirus. If you see any droppings at all, always take the safe course and do not create aerosols by blowing with compressed air, or aspirating with a vacuum. The safest method is to don a pair of rubber gloves and a respirator, wet down the droppings with bleach. The remains should then be placed into a trash bag and carefully sealed. Take additional time to thoroughly clean and wet down the chassis to remove any residual remains before going further. When I start a restoration, I make a quick inventory of items to be replaced, serviced or checked. Once the cleaning is complete I then attend to the electrical items. I realize that some folks feel the electrical should come before the cosmetic work. I find it much simpler, and enjoyable, to service a clean radio as opposed to a dirty one. Over the years I have tried many cleaning products, with varying success. What I have now settled on, and seems to do a good job, while preserving silk-screened chassis markings, is the commercial version of Windex. Windex, and a number of cloth rags. Cloth is much more durable than my earlier choice, paper towers. Cloth allows you to scrub firmly, and can be even used for a polishing effect on tarnished parts. For really stubborn, or nicotine coated units I resort to the Simple Green product. A word on black winkle, sometimes called “black crackle” paint. On most black wrinkle paint items I prefer to keep the original finish intact, as today’s paint compounds can not properly duplicate the subtle wrinkling effect of the early lead paints. Originally chosen for its durability, as well as its ability to hid minor sheet metal imperfections, this finish is amazingly forgiving, and most grime can be removed by gentle scrubbing with a nylon tipped bush and Go-Jo hand cleaner (without pumice). As a rule, I always remove all of the front knobs, inner sheet-metal covers, and trim bezels when doing a restoration. Be very careful with the Bakelite knobs, Windex seems to have a dulling effect on the Bakelite. I clean and then treat Bakelite items with Wurth Cockpit Cleaner. The Wurth product allows the dull shine to return to the knobs while not looking overly glossy. I also remove all the tubes, clean and test them before reinstalling. As part of the cleaning process I coat the pins with Ciag Deoxit compound. Metal tube shields receive a quick buff with Windex and the cleaning cloth. Any and all wax paper caps, no matter how new they look, should be replaced. I use the Sprague Orange Drop line of capacitors. While the Orange Drops are perhaps overkill, I know that they will not fail, and the unit, once fully serviced, is good for another 50 years. Special attention should be paid to the electrolytic capacitors in the power supply. Once the unit is fired up, one can check the audio output for hum, indicating a defective filter cap. Also check the outside can of the electroytics after the unit has been on for 10-15 minutes (be careful with this, some units, like the Heathkit DX-100, have the metal housing of the capacitor above ground potential). It should be at room temp, not overly warm. If the can feels warm then the cap is not doing its job and its time to replace it before it damages the power transformer. Yes, I know the process of “reforming” such caps, but my feeling is that if the cap is bad, it is not to be trusted, and I will replace. Power transformers are certainly more costly, and more difficult to locate than an electrolytic cap. Suppliers like Antique Electronics Supply are an excellent source of replacement caps, even the electrolytic series. Looking like a proper radio now The finished product! Surprisingly W7MGA’s 75A-1 powered right up and played like a charm. Just a simple touch up of the alignment was all that was needed to make the unit both look and play like it was fresh from the factory shipping crate! Just in time for the weekend, the transmitter arrived on Friday, September 29, 2006. Now the real challenge began, bringing the big 30K-1 back to life. One never knows what to expect with working with old electronics. Was the unit still working when put into storage, was it put aside due to some major component failure, or has some odd and unavailable component given up the ghost in the preceding decades of storage? I always assume the worse, and check for shorted power transformers, or other zorched components prior to any restoration work. Of course, half the battle is understanding WHY the component failed. For example, did the power transformer burn up because of a defective filter capacitor, or did it die on its own accord? Understanding this helps expedite the restoration process, and allows you to do a targeted, rather than shotgun type of repair. So let’s talk about the Collins 30K-1. I had plenty of time to read up on the transmitter prior to its arrival. Collins always did an outstanding job in their manuals explaining not just the operation, but also the theory behind the unit. Reading a Collins manual, with its excellent photos, schematics and theory of operation, is an education in itself. A few words about the 30K-1 design. One word that comes right to mind, especially if you are used to other amateur gear of the era, is “robust”! The 30K, although built as an amateur unit, shares many of the design characteristics with its big brother commercial broadcast gear, and is unusually roomy to work on. As mentioned before, the unit is housed in a 5-½ foot cabinet and consists of four separate decks; the high voltage power supply deck, the low voltage power supply deck, the modulator deck, and the RF deck. Power requirements are moderate, 115 VAC at 1350 watts of current. The RF output network, which is mounted by four ceramic standoffs to the front of the cabinet, completes the layout. Like most commercial broadcast transmitters, the heavy iron, in this case the plate transformer, is located on the bottom of the cabinet. Each deck is connected via a terminal strip on the rear panel allowing easy removal for servicing. Tube replacement and most other standard maintenance items can be carried out with the decks in place. Should deck removal become necessary, say for replacement of a under chassis component, you must remove the four retaining bolts which hold the deck to the support rails. Once these are moved, and the wiring disconnected, the deck slides right out. Be careful during deck removal or installation, its easy to damage the cabinet finish with the deck edges. To prevent this, I use blue painters tape, it leaves no residue, on the cabinet edge and rails. Two or three layers of tape offer plenty of protection against nicks and scratches. The high voltage deck uses a pair of 866 mercury vacuum rectifier tubes to handle the HV supply duties. The design is both simple and robust, really overbuilt for amateur service. The things to check here are pretty standard with any HV supply; look for arcing to ground, loose connections or damaged insulation. Heavy oil filled caps are used exclusively on this deck, so capacitor failure should not be an issue. I did find a problem with leakage in the 866 filament transformer on my 30K-4 transmitter. Check the obvious, and then bring everything up under low power for testing. In fact, it’s a good practice to leave the filaments on for several hours, just to bake any moisture out of the transformers, before you hit the plate switch. In general the HV and LV wiring insulation used by Collins appears to be very resistant to breakdown, and thankfully both of 30K-1 and 30K-4 units have excellent wiring. Failures of the plate transformer have been reported on the Collins reflector, so be cautious here. The plate transformer is a heavy Thordarson unit, secured to the cabinet base with four 12-24 retaining bolts. Mindful of the mild plate transformer hum on the 30K-4, I did something to try and quiet down this rig. I installed four 1.5 inch diameter rubber washers under the transformer mounting boss. This provides a solid attachment, yet serves to dampen some of the hum of the transformer under full load. The low voltage supply deck uses a standard line up of 5R4GYs for bias and low voltage rectification. The bias potentiometer for the 75th modulator tubes is located on this deck, you may want to clean and set it to midsection for now. Later, the bias for the modulators should be set to 45 ma. You may want to pay special attention to the filter caps on this deck, given the age of the transmitter, electroytics are used and they may be suspect. Thankfully mine required no attention, just a cosmetic cleaning of the deck itself. It’s on the modulator deck where things really get interesting. Collins chose the pretty but now rare 75th tubes as modulators. The 75th has a large circular globe, with a nice bright filament, and is really a very attractive tube in operation. Unfortunately Collins did not provide a viewing window for the modulator tubes, so one has to be content with the glow of the 4-125 final. The 75th has now become a somewhat rare tube, thankfully I found multiple sets included with my unit. Some folks have reported success using the more common 100th tubes as replacements, I understand a bias modification is necessary. Electrolytic caps are used on this deck as well, so be certain to check thoroughly both before and after the initial fire up. I did encounter a problem on this deck with the audio gain pot in the speech amplifier circuit. A trip to my junk box produced the requite 500K potentiometer and we were back in business. Be sure to lubricate and clean up any switch shafts and contacts. The RF deck is perhaps the simplest of all the decks in the unit to clean and service. Removal from the unit is rather straightforward. Remove the front two adjusting knobs, the large air variable capacitor support insulator, plate cap on the 4-125 final tube, and finally unbolt to the two choke leads from the bandswitch. Remove the five wires from the terminal block and you are home free. While you’re under the deck you might as well remove the two screws that retain the two RF chokes, along with the one screw that grounds the RF chokes to the chassis. With the chokes and the large fixed capacitor removed, cleaning the deck is quite straightforward. Once you have the RF deck on the bench, I advise that you blow off as much loose dust as possible with compressed air. Then use a strong shop vacuum to pull off any reaming dust and dirt. The large fixed capacitor removes quite easier from the deck, just two retaining screws. This capacitor is very difficult to clean when assembled and as any dirt here provides an easy arc over path, its well worth the time to disassemble and thoroughly clean the capacitor plates and hardware. What I like to do with a small chassis, especially if heavily soiled, is to use Simple Green and shop rag to wipe down the deck. Next turn the deck on its side and spray a heavy coating of cleaner on the top and underside. Allow this work its magic for perhaps 5-10 minutes then rise clean with tap water. A quick trip into 200-degree oven for 5-10 minutes does wonders for the final dry cycle. Now you can Q-tip any residual staining or dirt, especially around the terminal block. Allow the chassis to air-dry overnight and its ready for reinstallation. Collins built a very robust and flexible link coupled output network in the 30K-1, allowing both parallel and series tuning. The lower bands, 80 and 40 are handled with one large plug in coil, while the upper bands use a somewhat smaller coil unit. RF is output through one set of feedthrough insulators mounted on the upper rear of the cabinet. Thinking ahead, Collins design made provision for the use of multiple antennas with the installation of additional feedthroughs and the ability to directly tap off each section of the bandswitch. My unit had apparently sustained some impact during its trip from California, as each of the four porcelain standoffs that mount the network to the inside of the front panel was broken. These standoffs are of the standard tapered design, often found at hamfests; thankfully my junk box yielded four identical spares. My output network was very dirty, and given the complexity of the coils and windings, it was not an easy clean up job. A trip through the dishwasher, at low heat, was in order. The unit emerged looking like new, and I took a few moments to clean and tighten all hardware, and then lubricate shafts and linkages before reinstallation. Before installing the output network, I removed the large meter panel from the upper top of the cabinet. The 30K uses a meter display similar to many broadcast transmitters of its era, behind glass. The meters were fine, requiring only a cosmetic cleaning, but the glass was a filthy. I have yet to find anything that cleans glass better than Windex and newsprint, and soon the meter display was reinstalled and looking like the day it left the factory. W7MGA had fabricated a very clever antenna switching arrangement in my 30K-1. If you look closely at the rear of the bandswitch you will note a black DPDT knife switch mounted on a Lucite disc. By this unit he was able to select multiple antennas for different bands. Desiring to return my unit to stock, it was a simple matter to remove the three screws that secured the switch. I then found the original bandswitch jumpers which Collins had installed at the factory, the previous owner had thoughtfully hung those inside the cabinet on a piece of wire when he installed his antenna switch! So, with the addition of just a few jumper wires from the bandswitch to the porcelain feedthroughs, RF was once again ready to flow. One thing that I should comment on was the respect that the W7MGA had given the rig. It was obvious to me that he cared for it greatly, carefully building the Lucite antenna switching device, collecting multiples of spare tubes, retention of the Collins manuals and marketing material, even fabricating a black wrinkle finished dolly to move it around. He went so far as to build a wooden base to hold spare tubes, and to construct a classy glass and wood enclosure for the antenna coil used on the higher bands. Unlike much amateur gear we see today, no additional holes, switches, or modifications were found. It was clear to me that Walter had a great respect for this transmitter, and that further inspired me to continue on in his tradition. With the decks all cleaned, serviced and tested, the final step remained, powering up the unit. I checked and double-checked each connection, making certain that all was well and proper. Preparing for the event, I had both camera and video recording gear on hand and rolling when I throw the filament switch. It was, in a word, a nonevent. No spark, arcs, or blow fuses, it just worked. And so, just after 9:30PM on October 2, 2006, Collins 30K1, serial number 32 returned to life. I joyfully recorded this moment with both still and video cameras, as one would a new child. Then, after just 5 minutes of operation the filaments in the 75th modulator tubes promptly went out. I had intended to just let the filaments run for several hours to dry out the transformers and vaporize the mercury in the 866 rectifier tubes. The apparent filament failure puzzled me, but feeling emotionally and physically exhausted from nearly 12 hours of work, I called it a night and powered down the unit. In my head it knew it could be anything, but in my heart I feared the worse, a failed filament transformer. It was with this in mind that I grabbed the schematic on my exit from the workshop. After staying up until 1AM that night studying the schematics, I tried again the next day. I plugged in the 30K, gingerly turned on the filament power, and checked the modulator tubes, no joy, no light. It then occurred to me that as the 4-125 and 75th tubes share the same filament transformer, and the 4-125 filament was lit, it must be something in the wiring of the mod deck filaments. I thought and I pondered, doubled checked my wiring, looked for smoked components under the chassis. I checked the schematic again, and then broke out the toolkit and DVM to check voltages. Then, suddenly, I heard the voice of Art, yes Art Collins himself, calling to me across time and space (not really, but that sure sounds good!). It occurred to me to turn the FONE/CW switch, and like magic the filaments lit! That switch must have been right on the very edge of the detent and snapped over when I was moved things around while checking out the transmitter last night. I had noted a problem with the switch while cleaning the mod deck; it was very stiff to turn. I had gently heated it up and applied oil to the shaft, which, after some work, made an improvement. It appears that I must have left the switch not quite on the detent and it snapped over to the CW position, removing filament voltage from the 75th tubes! It was just sheer coincidence that this occurred while testing out the filament supply. With the filament problem now handled, I turned to the Collins 310A exciter. The unit was in very good condition and it was simply a matter of attaching the 5-wire harness from the 30K to the 310 so the unit could be powered up for testing. The RF cable from the exciter uses one of those old single pin connectors like you would frequently see on transmitters like the Heathkit DX-100. So, with the exciter properly cabled to the transmitter, it was just a matter of putting the exciter switch into the “SEND” position and check the grid drive. Some tweaking of the input network controls on the 30K produced grid drive, but with a low reading of 7ma in the tune position. Ideal grid drive for the 30K-1 is 12-15 ma, so some work was indicated here. Just to check for output and make certain that the exciter was near frequency, I turned on the 75A-1 receiver. A quick check confirmed that we are operating on or about 3885 kc, not bad for a 50-year-old unit. Still more work was indicated on the exciter before we could properly test the 30K-1 under load. 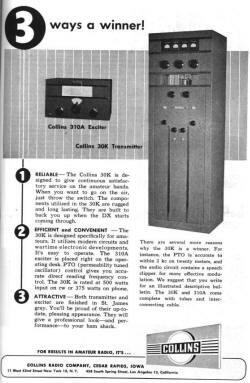 The Collins 310A, another Warren Bruene design, is like a small transmitter in itself. Using the venerable Collins Permeability Tuned Oscillator, and a pair of 807 tubes, the unit is as robust as the transmitter it is matched with. Servicing the 310A could not be easier. It does not need to be connected to the 30K-1 for service; just a simple line cord to a wall outlet provides all that is needed. I had a moment of consternation during servicing the 310A which I will relate in the hopes of saving someone else grief. The exciter, which worked fine with the 30K-1 (abet with low output), had no output on the test bench. It was time for a rest break, and after a cup of green tea, and reading the schematic several times I figured out the simple cause. The front panel keying jack is of the shorting type and provides a ground return for the cathode resistor of the 6AG7 tube. When I removed the exciter from the cabinet I had disconnected the keying jack, therefore disabling the operation of the tube. A jumper was quickly fabricated and we were back in business. During my initial testing I had noted low grid drive on the 30K-1, which translated into low output from the exciter. I removed the exciter bottom cover and quickly found the cause. The 310A uses a series of three ganged air variable caps, driven off the front tuning gear train. The first air variable, which tunes the low oscillator stages, was fine, but the other two air variables were not tracking with the first, owing to a loose coupling. The rear air variable, used to control tracking of the 310A’s output network was not moving, not was the small cap used to turn the input to the first 807 tube. Thankfully it was Collin’s excellent manuals to the rescue again, and after a quick review I understood the problem, and how to correct it. It is a bit of a procedure to get the three air variables tracking properly, but once done it should last for a lone time. Thoughtfully Collins provides two test points for measuring both the grid input to the 807 and the plate current. By the removal of two jumpers, a milliamp meter can be interested to quickly align the circuits. An excellent design, and one that allowed me to quickly get the 310A back on-line. Over the next few days I checked various voltages in the transmitter, ran on low power into a dummy load, and was finally ready, a week after its arrival from California, to test it on the air. The maiden voyage of serial number 32 was carried out on October 8, 2006 with KA1KAQ. Both the audio and signal reports were strong, with the D-104 on one end and the balanced feed 160 meter dipole on the other. At the rated Fone plate current, 150 ma, the 4-125 final tube has dull red or cherry glow, and the complete transmitter, which uses no fans – only convection cooling, is remarkably quiet. Air tests continued on and off during the week until I was satisfied that the unit could be moved back against the wall, and the 75A-1 and 310A be installed permanently into the station. Bill KC2IFR was kind enough to send me a recording of me on the 30K-1, and it was a real pleasure to finally hear myself on the rig. Operation of the 30K-1 on the air could not be simpler, once you get used to the lack of Push-To-Talk operation. Rather than keying off the microphone handle of the D-104, the 30K-1 is designed to be keyed off the front panel switch of the 310A exciter. One simply places the 310A switch in the CAL position to zero beat the 75A-1 receiver, then in the REC position to listen in, and finally in the SEND to key the 30K-1 and transmit. It does take some getting used to, remembering to turn the switch to go from send to receive, but after some use it becomes quite natural. Provision is even made in the 310A to mute the 75A-1 during transmit. The 30K-1, with its 250 watts of AM Fone power, is great for those late night QSOs. You know that you have plenty of reserve power to overcome atmospherics, and still provide the static quieting full-bodied AM sound. The stock 30K-1 audio is as Collins intended it, punchy and crisp, not at all objectionable. A limiter, using a 6H6 tube, was engineered into the unit to allow full modulation without distortion; I’ve left this intact. The limiter can be defeated by adjusting the pot, or just removing the 6H6 tube. In the interests of authenticity, I have chosen to keep my unit entirely stock, feeling that any minor improvement in sound would be a disservice to the true nature of the unit. With the exception of changing the output coil for the higher bands, everything on the 30K-1 can be controlled from the front panel of the transmitter or exciter. Bandswitching, grid tuning, and output matching are easily accessible. Collins thought of almost everything with the 30K-1, 310A and 75A-1 station, it really was the dream station of the 1940s radio amateur, and for me remains so today, some 60 years after its introduction. I delight on bringing back this gear, and while I enjoy using it now, I take additional joy in knowing that I am in, some small way, preserving it for future generations of radio amateurs. For in many ways I feel that I am not so much the owner, as I am the caretaker of these radios. They are all that is left of the once proud American radio industry, and deserve the best of treatment so they may bet passed on to future generations. In closing I want to thank Todd Bigelow KA1KAQ for his countless hours of encouragement, Peter Brickey K6DGH for his tireless efforts to get the station to me without damage, Conrad Jahries WB7DHJ for sharing about his father, the good folks on the Collins Collector’s Association email reflector for their information, and finally Walter, W7MGA himself, for building and maintaining such a wonderful station. Your help has been invaluable to help this transmitter live again, and continue to be part of W7MGA and amateur radio’s rich legacy.